Uncategories How Long Shahid Afridi's Biggest Six Actually Was? How Long Shahid Afridi's Biggest Six Actually Was? Shahid Afridi is in news from Sunday for playing an great inning of 88 runs on just 48 balls against South Africa in 3rd ODI Match. 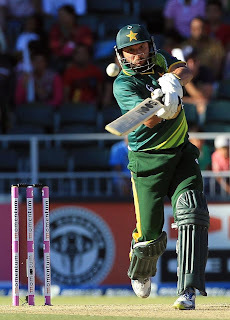 Shahid Afridi hit many big sixes during this great inning. One six that Afridi hit to Ryan Mclaren was son long that it went to a Golf Course outside th Stadium. Lot of people are debating that what was actual length of that Six? some are calling it 160 meters long while other are claiming that it was 154 meters long. However according to some experts the six was around 120 meters long as it first landed on the roof of Stadium and then went outside. no one is able to tell the actual length of the six so far.